Well, we all know that the Empire State Development Corporation (ESDC) was willing to repeat Forest City Ratner's not-credible claim last December that lawsuits--as opposed to a cash crunch--had stopped ongoing work at the Metropolitan Transportation Authority's Vanderbilt Yard. 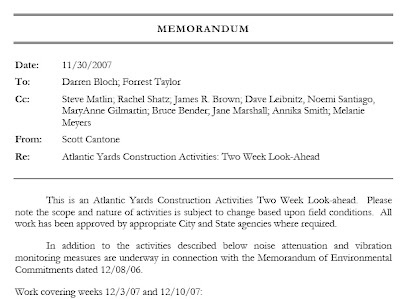 Here's another example, in which documents prove that Forest City Ratner--not the ESDC--is the author of the not-so-informative semi-monthly Atlantic Yards Construction Updates. In an effort to keep the Atlantic Yards Community aware of upcoming construction activities, ESD and Forest City Ratner provide the following outline of anticipated upcoming construction activities. The statement that "ESD and Forest City Ratner provide" suggests that the state agency should be willing to answer questions raised by discrepancies in the updates, such as my query about why announced utility work on Pacific Street never apparently occurred. However, the ESDC sent me to Forest City Ratner, which ignores my queries and, not being a government agency, is not subject to any oversight. So the government and the developer should be asked about Pacific Street utility work at the upcoming Senate oversight hearing. Why didn't the ESDC answer me? One plausible explanation is that it didn't have an answer--because it's merely a conduit for a document prepared by Forest City Ratner. How do I know this? 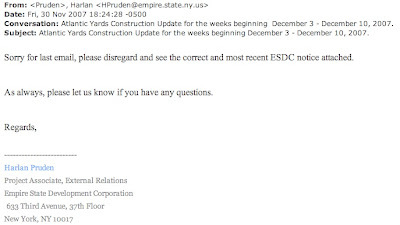 As a resident who gets construction updates emailed directly explained to me, the ESDC slipped once, failing to strip Forest City Ratner employees' names from a memo emerging from the developer's office. The update was followed by this apologetic email from an Empire State Development Corporation staffer. 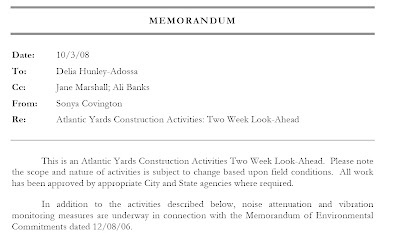 For another example of the original form of the updates, see this message, excerpted below, from FCR's Sonya Covington to Delia Hunley-Adossa of Community Benefits Agreement signatory Brooklyn Endeavor Experience.